Athletes are illustrated across a wall of orange tubes in this canteen at the headquarters of sports brand Nike in Hilversum, the Netherlands, by Amsterdam studio UXUS. Developed in collaboration with the Nike design team, the dining room contains individual tables and timber-slatted booths adorned with logos and statistics. Coloured chairs and picnic benches provide additional seating in the canteen, which is located at the company's Europe, Middle East and Africa headquarters. White graphics on the walls of the kitchen list the favoured lunches of sports stars including Maria Sharapova and Paula Radcliffe. A glass-fronted mezzanine at first floor level overlooks the ground floor. See also: K-Swiss pop-up store by UXUS Design. Photography is by Dim Balsem. 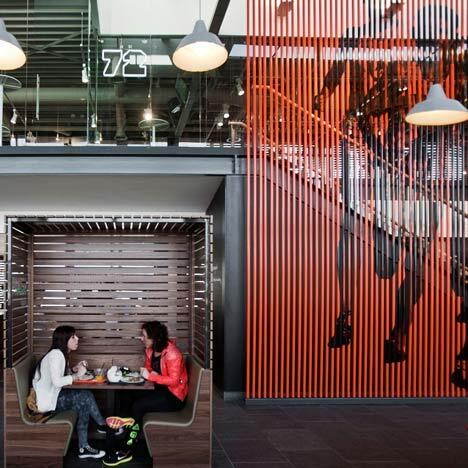 Nike EMEA Headquarters commissioned UXUS to be part of the team to re-design their corporate canteen. The objective was to create a personalized, social hub inspired by sports that encouraged and enabled the exchange of ideas. Working alongside the Nike design team, UXUS created a space utilizing mismatched elements to accommodate the various moods and needs of the employees. Semi-enclosed areas and cozy spaces offer solitude,while vast tables and counters stimulate interaction. Every element was designed for efficiency and the ability of employees to create a personalized eating experience. Material choices were inspired by sports facilities with contrasting bright and neutral colors. Various ceiling elements such as low hanging lamps create rhythm to diffuse and humanize the tall volume of the main eating hall, while a striking, orange tube wall with super-graphic ties the 2 levels together. The printed graphics were created by Matte Amsterdam.